KCNA: "A national software contest of university students took place at Kim Chaek University of TechnologyPresented in the contest were problems requiring multifarious and wide-ranging knowledge of mathematics, computer, etc. and the capacity of designing algorithm." KCNA: "Over the 5th north-south summit, an exciting eventin the history of the nation, the people from all walks of life in the south have praised the Supreme Leader as a 'really admirable and excellent person'and 'the person arousing deep emotion, happiness and honor'." KCNA: "He brought a dramatic change to the situation of the Korean peninsula through the proactive and sincere, new policy of improving the north-south relations and the continuous exceptional measures based on it." KCNA: "The Supreme Leader, possessed of noble compatriotism and fixed will to reunify the country, opened a new phase for the development of inter-Korean relations and peace and prosperity on the Korean peninsula with his distinguished political ability." KCNA: "The world is admiring at the outstanding political ability of Supreme Leader Kim Jong Un who ushered in a heyday of peace and reunification on the Korean peninsula through the historic 5th north-south summit." 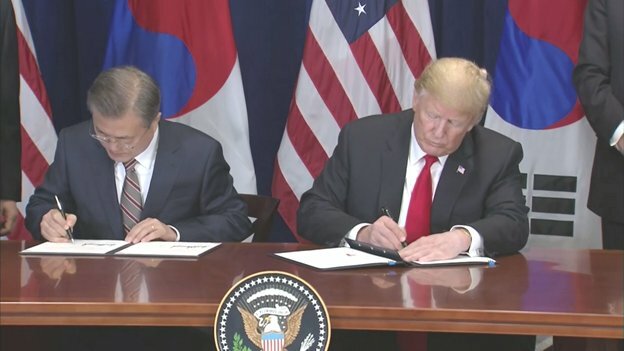 Gen. Abrams, up to lead @USForcesKorea says, "I think that there was certainly degradation to the readiness of the force" in Korea -"That's a key exercise to maintain continuity and to continue to practice our interoperability, and so there was a slight degradation"
Pres Moon and Pres Trump sign the revised US-South Korea Free Trade Agreement. "I've never seen my name in Korean," said @POTUS. "It looks nice." [email protected]: US-Korea Free Trade Agreement Signing Ceremony. [email protected]: "The new U.S.-Korea agreement includes significant improvements to reduce our trade deficit and to expand opportunities to export America products to South Korea." Second summit with DPRK leader Kim Jong Un is likely "quite soon," according to @POTUS. KCNA: "UN Secretary-General Antonio Guterres received credentials from the DPRK permanent representative at the UN on Sep. 20."